Valus Odiil is a retired adventurer-turned-farmer living in Chorrol. He and his two sons, Antus and Rallus, have recently been chased off their farm by marauding goblins, and they will need your help to get rid of them. He wears common middle-class clothing: a quilted doublet, tan linens and doeskin shoes. He's armed with an iron dagger and carries medium-sized amount of gold, eight bottles of Mead, the key to his house, and the key to the Odiil Farm house. You may hear Chorrol citizens talking about him: "I saw Valus Odiil at the Grey Mare again today. Hasn't been the same since his boys took off." or "Have you seen Valus Odiil recently? Spends all day in the tavern since his boys left." Should he see you as you approach him, he will ask you about his missing sons: "Hello. You haven't seen my sons, have you? They went off into the forest to fight those monsters, and I'm worried about them." As you engage in conversation, he will sound very upset: "My sons! Have you seen my sons?" When you ask about them, he will explain: "Yes, Rallus and Antus. They're going to fight off the creatures at our farm, but I fear for their safety." You can then ask him about these creatures: "For the last few days, we've suffered attacks from these creatures at our farm not far from Chorrol. They're coming from someplace in the Great Forest. I don't know where, but Rallus may know more by now. My boys will take up the fight even if the guards won't. Doesn't matter if it's outside the town walls - it still affects us all. They expect me to go with them, but... I fear in my old age, I'm not the warrior I once was. Would you... would you go in my place?" If you refuse, he will be disappointed: "I won't beg you, but I ask that you please reconsider. My boys need another steady hand at their side, else they may not survive." If you agree, however, you will start The Killing Field quest and he will be most pleased: "Somehow I knew you'd do the right thing. I'm supposed to meet them at Weynon Priory. You'd best get whatever supplies you need now, so you can get there in time. I... I need a drink to calm my nerves. Please, excuse me." When you return to him after the battle at the farm, he may greet you according to the result of the quest. If both sons have survived, he will greet you as he sees them: "You're back! And you've brought my sons with you! How wonderful!" When you've come back with Antus only, he will say: "You're back! And Antus is with you.... thank you for bringing him home safely. But where is Rallus? I don't see him... oh, please tell me I haven't lost one of my sons." When only Rallus has come back with you, he will say: "You're back! And Rallus is with you.... but where is Antus? I don't see him." When you tell what happened, his reaction will depend on the survival of his sons. When both have survived, he will be overjoyed and reward you with Chillrend: "My boys are safe! Oh, thank you! Thanks so much for sticking with them and helping a foolish old man. Please, take this... I won't be needing it any longer. My battles are over. I plan to live out my days on the farm in peace and quiet." If either Antus or Rallus died, he will be devastated: "I... I've lost a son? No! It can't be! I should've been with them! It should've been me, not one of them! I... I'm sorry. You did all you could, I'm sure. Thank you for trying. I'm afraid I have little to offer you - what little money I have must now be spent on a burial. Please, if you'll excuse me. ", at which point you get 150 gold. If both sons have died, he will, obviously, be devastated as well: "They.... they didn't make it? Oh god. They died out there all alone... I should've been with them! It should've been me, not them! I... I'm sorry. You did all you could, I'm sure. Thank you for trying. I'm afraid I have nothing to offer you - what little money I have must now be spent on burials. Please, if you'll excuse me." He may provide you a bit of information about Nibenese people: "That's what we call folk from the eastern side of Cyrodiil. The old name of the lowland part of Cyrodiil is Nibenay." He does not offer any services. In particular, he does not offer Heavy Armor training. However, he will provide a recommendation for Heavy Armor Master Training with Pranal: "Long ago, I learned much of what I know from a man named Pranal. An excellent teacher, he was. You should consider learning from him. I met him in Hammerfell, but I understand he moved to Cyrodiil a few years back. The Roxey Inn, I think? You should look there for him." Heavy Armor Master Training: A retired soldier wants you to find a present for his beloved before he will train you. The Killing Field: Valus Odiil in The Grey Mare in Chorrol needs you to help his sons reclaim his besieged farm. Valus Odiil's Key is useless; it doesn't open anything. 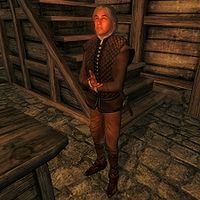 This issue has been addressed by the Unofficial Oblivion Patch; it now opens his house door. Esta página foi modificada pela última vez à(s) 23h01min de 2 de junho de 2015.